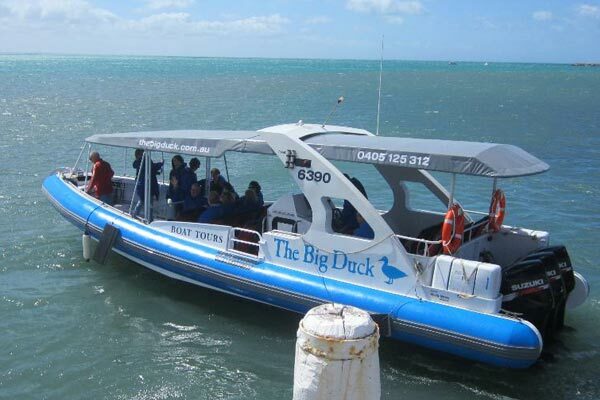 For this extended tour, The Big Duck again departs from the Granite Island Causeway and cruises slowly between the mainland and the northern side of Granite Island, affording breathtaking views of both the Victor Harbor shoreline and the island. Once past the breakwater The Big Duck picks up its pace. Seal Rock is the first stop, where New Zealand Fur Seals and Australian Sea Lions bask in the sun between fishing forays and swimming out to the boat for a sticky-beak! Then on past the huge granite boulders of Wright Island and the Bluff, with Shark Alley in between where Dan talks about the whaling history of the area. Many visitors to Victor Harbor never venture past Petrel Coveon the western side of The Bluff, but this is where passengers on The Big Duck are in for a real treat! West Island is aConservation Park, complete with a research hut used by the universities and park rangers. From the back of the island another colony of seals and sea lions can often be seen basking on the rocks and swimming in the shallows. Seabirdsabound in this remote area and often pods of common and bottlenose dolphins can be spotted playing or feeding. The Big Duck heads further west past the darkly spectacular cliffs of Kings Beach and Waitpinga before turning around and heading back to Granite Island. During winter Southern Right Whales and Humpback Whales migrate from Antarctic waters to the warmer ocean around Australia to feed, mate and give birth. The Big Duck is a licensed whale watching vessel and it is a privilege to enter the Southern Right Whale breeding sanctuary of Encounter Bay and to view these majestic animals from the waterline. The number of whales seen near Victor Harbor is highly variable year-to-year, and Southern Right Whales are much larger and less active (above the waterline) than Humpback Whales commonly seen on the East Coast of Australia. For this reason, whale sightings cannot be guaranteed on our tours and winter tours may take the route to see seals, sea lions and dolphins. When whales are present, our tours head west towards Port Elliot, past swimming and surfing beaches where dolphins can often be seen playing. We stop near Pullen Island to look for New Zealand fur seals as they bask on the rocks. The tour then ventures through Horseshoe Bay towards Bashams Beach where the whales can be seen basking in the warm shallow water which provides the perfect conditions for giving birth to calves. This tour departs from and returns to the Granite Island causeway. Our marine mammal permit allows us to Whale Watch up to 300m away from these amazing creatures. We recommend bringing a camera with a zoom lens for best whale photos.